It’s nothing but a simple waltz, part of the much larger and more ambitious Nutcracker, yet it’s arguably my favorite piece of music. When I hear Tchaikovsky’s “Waltz of the Flowers”, which I have several times this Christmas season, it produces within me a visceral reaction that no other work can produce. I must, I simply must conduct it. That instinctual response got me into trouble in the fourth grade. My teacher, Miss Clancy, a caricature of a grammar school spinster (though she was probably only in her thirties) who held an unmistakable bias against little boys, played the song for her class – her attempt, I suppose, to inculcate us with an appreciation for the classics. It backfired, sort of. In a rapture of the joie de waltz that remains to this day, I began to lead the invisible orchestra in her portable record player. Miss Clancy didn’t appreciate my fledgling Fiedler fling. She punished my exuberance by making me stand in the hallway outside the classroom and conduct to an audience of lockers and amused passersby. The trauma of that event has diminished over the years. (Not completely. I derived a twisted satisfaction upon learning that Miss Clancy later married and had a brood of boys. What goes around…) Despite Miss Clancy’s misguided discipline, my love for WotF and classical music in general has only heightened since that agonizing ordeal. In fact, I’m writing this in the afterglow of hearing the waltz, which was of course conducted by yours truly, the virtual maestro. The other childhood memory the song conjures up is a cartoon that inspired my initial love for the piece, an animated story presented to the tune of the magnificent music. The original animation appears to have disappeared over the years, but I found a reading of the story on YouTube here. 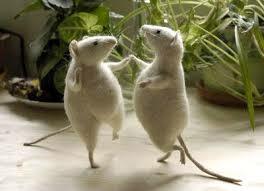 It involves a pack of mice who disguise themselves as flowers and waltz safely past a crowd of ravenous cats. The music was a life-saver then and a life-enhancer now. If you know where I can see that cartoon, let me know. Every child should see it. Keep waltzing and keep conducting… no matter what the Miss Clancys of the world do. This entry was posted in General and tagged conductor, dance, discipline, grammar school, mice, nutcracker, tchaikovsky, waltz of the flowers. Bookmark the permalink. I find it a supreme case of irony that I’ve stumbled across this post…even as old as it is and it being dated with my birth date of 12/27…while looking for the same video! I saw that cartoon when I was 3 years old, fell in love with Tchaikovsky and never fell out again. Did you ever find the cartoon? If so please, please contact me. Everyone thinks I’m nuts when I try to explain the how/why of how I came to love Tchaikovsky. Sadly, the cartoon remains lost to the ages… at least to my ages. Maybe it’s appropriate. Some things are so wonderful they are best cherished only in our memory. But I still want to see it again!! If I do, I’ll add a comment here. I’m so glad you found this post and commented on it. You caused me to re-read it and arouse all those powerful memories. May they live forever. In case you’re following these comments, see my new comment below to find the original cartoon. I have also been looking for that video since I was young! I never heard anyone talk about it until now and was starting to think I had made the whole thing up! Everyone I’ve ever talked to about it, including my own parents, were confused. If anyone ever finds it, that would be amazing. That makes three of us: you, me, and the other commenter. If the plea goes viral, maybe the video will turn up somewhere. How many other Boomers had their introduction to classical music through this masterpiece? Thanx for adding your voice to the growing chorus, Sam! Strangely now, almost a year after my original comment on your post, a second search for the animation lead me to your blog post again by happenstance! I never realized you had answered me initially and just wanted to say that I am actually only 25! So that video was still being inspirational to kids like me maybe only 20 years ago. I wonder whatever happened to it? Honestly, I have no way of knowing if this is the soundtrack to the animated film or simply a purely audio version of a similar tale. It’s all we have, so I’ll take it. Thank you for your interest in this video. It attests to the longevity of a true classic, a category in which this belongs. In case you’re following these comments, Sam, see my new comment below to find the original cartoon.